Vilano has long been in the sporting industry making quality push bikes, but recently they decided to expand their offerings to stand-up paddle boards (SUP). The Vilano Navigator is one of their top offerings, and many people new to SUP find that this board is ideal. The way Vilano creates their Navigator iSUP ensures that once it’s fully inflated, it will stay rigid and create extra stability on the water. The grip deck on top of the board also features a diamond groove traction that allows riders to stay on the board, even in choppier conditions. It also adds a level of cushion and comfort so you can use your board for longer trips. 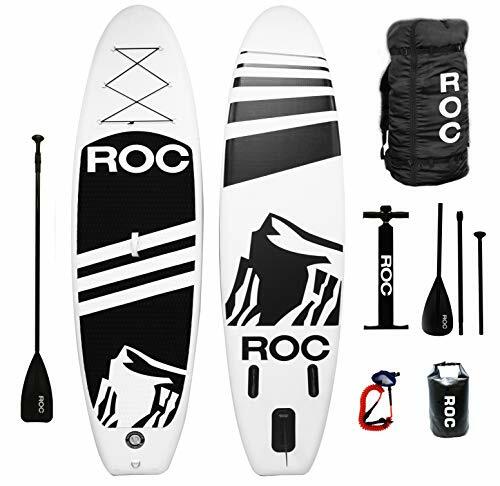 The board also comes with an adjustable paddle, carrying strap, pump, and a backpack to store and tote all your equipment. Many of the top features on the Vilano Navigator make it easy for novice riders to pick up on this relaxing sport. The accessories included with this board also means that you can get started right away without having to purchase extra equipment. Want to learn more about this board? Here is our Vilano Navigator review. There are a lot of boards on the market, and inflatable SUP (iSUP) are relatively new. It can be challenging to know where to start if you have never bought a board before. 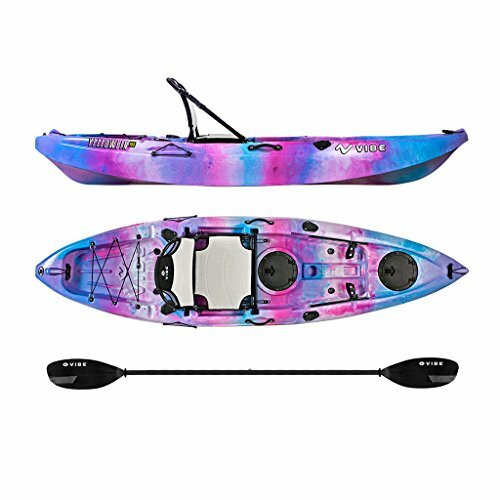 The Vilano 10 is not for professional or advanced paddle boarders, but it’s durable design make it great for beginners. Rigidity and stability are essential issues with many iSUP, and the Vilano navigator does an excellent job addressing those. The board is made with high-grade PVC material along with a Korean drop-stitch construction. The PVC material means that once you’re out on the water, the board will keep its shape and allow you to stay upright. All important things for new riders! The drop-stitch means the cover is flexible and fits the core of the board without rippling or tearing. The board also comes with a fin that helps it in different water settings. This board is mainly for calmer waters on lakes and smaller bodies of water, but if you do use it in choppier conditions, the fin can help. The fact that it is detachable makes it easy to customize your ride to the water conditions that day. The design of the board includes a unique diamond groove pattern that makes it easier to stay upright. Novice riders can use the extra grip to help them as they learn the ins and outs of paddle boarding. While the construction of the board is crucial, the accessories that come with the Vilano Navigator make it a truly great board. Along with the board, you will also get a pump, the removable fin, patch/valve repair kit, a carrying strap, backpack, and paddle. The pump, while small, will help you get the board to the proper psi to ride. The paddle comes in three parts so it is easier to transport and you can remove the strap while riding, so you don’t have to deal with it. There is a central handle that can be used along with the carrying strap so that the board, which is relatively light at 26 pounds, is even easier to carry in and out of the water. The board itself comes with a bungee system on the front so you can securely transport your equipment while you are on the board. Along with the two D-rings that you use for the straps, there are four additional D-rings with a bungee cord that allow you to carry cargo such as a cooler or backpacks. There are also D-rings that enable you to attach a kayak seat to the board. This is a great feature for people who want to sit rather than stand or parents that want a safe place for their kids on the board while they paddle around. Added stability for novice riders – The extra wide diamond-groove pattern covers most of the deck, so no matter where you stand on the board, you can get a good grip. This design also adds extra cushion, so even if you have a long day on the board your feet won’t get tired. Cargo space & add-on features – Four D-rings allow you to tote a cooler or other cargo that you might need if you will be out on the water for most of the day. The additional D-rings on the board make it simple to add a seat which makes the board even more versatile. Sturdy construction – High quality PVC material means the board will stay stable once it’s properly inflated allowing more stability and durability. The Korean drop-stitch cover just adds to the strength of the board and allows you to use it for years to come. Accessories included – Vilano Navigator comes with all the tools and accessories you need to get out on the water right away. 1-Year warranty – Comes with a 1-year manufacturer’s warranty that covers workmanship and materials. Talking about all the features and specs of the board are a good place to start but hearing from actual customers can help you feel better about your purchase. So, what do customers think? Most people, especially new users, really like the Vilano Navigator 10. Many users like that it is easy to assemble and just as easy to get everything back into the backpack, which can be difficult on some models. People also like that the board handles really well on calm lakes and use it often for family vacations and trips. There are a few things that go on the con list though, including the pump. Some people found it was really challenging to get the last few psi and it took about 15 minutes to inflate the board. Users also said that even though it was nice that the board is light, it can be a little less stable than a traditional fiberglass board. A few customers had problems with punctures if they took it out into rougher waters, but on the whole, the board handled well in calmer situations. Even with these few issues, customers really liked the way that the Vilano Navigator 10 handled out on the water. Many customers who have been stand-up paddling for a while loved that they could keep this board in the backpack in their car instead of having to attach it to their roof like regular boards. They also said this is an extremely durable iSUP that is a great purchase if you want to get started with this sport. Parents with little kids who bought this board enjoyed the fact that they could stand up and paddle and attach a kayak seat and have their child ride with them. The majority of customers would recommend this board to other riders as a wonderful place to start. The Vilano Navigator 10 Inflatable SUP is smartly constructed to make sure you get a durable board that will help you learn the ropes if you’re new to the sport. PVC material along with Korean drop-stitch keep the board rigid and strong while the diamond-groove deck assist beginners as they learn to balance on the board. The accessories also mean that novice riders don’t have to purchase a ton of extra equipment to get started. The paddle, patch/valve repair kit, and pump all fit with the board into a backpack that makes carrying everything simple. Even fully inflated, the center handle and strap mean you can move with ease while carrying the board. You can also make this board much more than a stand-up paddleboard. If you attach a kayak seat, you can sit rather than stand, which is great for kids or older people who don’t have great balance. The extra D-rings mean you can carry all your extras along on your trip, and the bungee system keeps your gear secure while you’re on the water. Hopefully, this Vilano Navigator review helped you learn the features of this board and get you closer to getting out on the water on an iSUP!